4 June 2008, at 3:26a.m. US - CME's Daily Livestock Report for 3rd June, 2008. News that a low pathogenic type of bird flu was discovered in a Tyson owned broiler flock caused the company’s shares, as well as shares of other large poultry companies, to decline as much as 6% on Tuesday. There has been plenty of reporting on the issue so we will not go into all the details. The infection was discovered in a Tyson flock in Arkansas. As a result, about 15,000 birds are expected to be destroyed. Given the size of the industry, this is a very small number of birds and will have no impact poultry output. This is not the much feared H5N1 strain but rather a less infective type that occasionally has been found in US poultry. While there may still be some confusion in the popular press, generally we expect the media to cover this for what it is, a relatively minor event that poses no risk to the general public. The infection did not cause any bird deaths, rather it was discovered as part of routine testing. Again this is good news as it points to the effectiveness of such tests and that there is a very good possibility this will be a limited event. USDA has placed a ban on poultry exports from Arkansas to Russia as part of a previous accord relating to possible outbreaks. It is still too early to say what the impact on exports will be. If the issue is limited only to exports of Arkansas broilers to Russia, then exports will not be affected as processors shift their schedules and fill export orders out of their plants in other states. We do not know how other countries will react. Russia is the largest market for US broiler meat but in Q1 it accounted for 28% of all US broiler exports, 72% went to other markets. 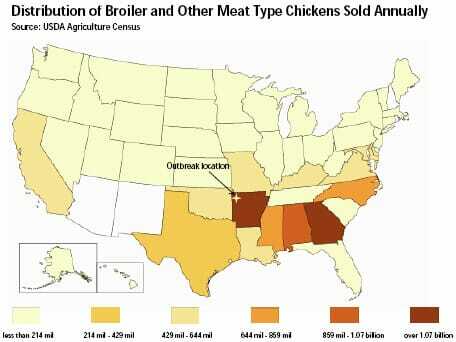 Will these markets ban just broiler meat from Arkansas or will they place broader bans on US poultry? No one knows but our opinion is that this will likely have limited export implications given the current global food crisis. While a ban on US poultry would temporarily depress US poultry prices in the US, it would raise poultry prices globally. There is little appetite in Russia, Mexico and other importers of US poultry to add to domestic food price inflation. Bottom line for livestock: If export bans are limited to Arkansas, impact will be minimal. If export bans, even temporarily, include all US poultry, this would be short term bearish for beef and pork.